While Japanese and American cultures are as different as Earth and Mars, there is a unifying thread: their passion and fervor for music. Metal is underground and beloved in the Far East as much as it is loved domestically, and extreme grindcorists Unholy Grave make a beautiful, Japanese racket that is slowly but surely crossing West. Vocalist Takaho broke down some of the differences between the Japanese and American scenes, telling Noisecreep, "Both have different gig systems. However the attitude is the same, I think. Both scenes are based on passion for the music." 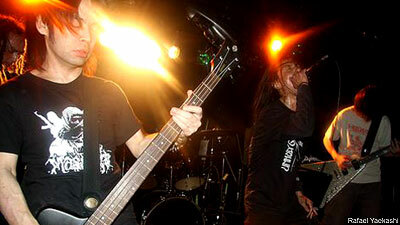 Unholy Grave won't be hitting American soil in 2010, but they'll play locally and release some split EPs. "We'd love to play abroad in 2010 -- give us tickets," Takaho joked. The band, which has played East and West Coast dates in the past, dub their music "unholy grindcore," and they name check everyone from Gism to Repulsion to Metallica to the Ramones as influences. They've been deafening audiences since 1993. "It's blend of all kind of extreme music," Takaho said. "It's loud, fast, simple and mind-grinding."